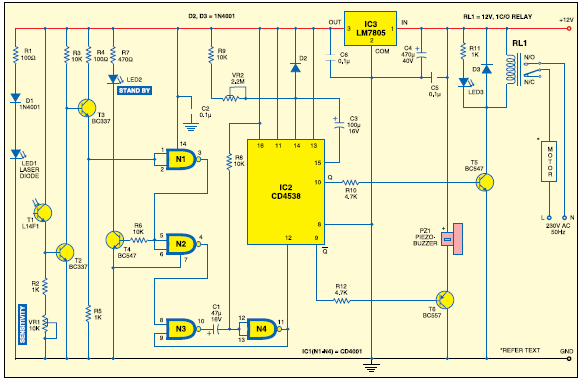 This automatic door opener can be made using readily available components. The electromagnetic relay at the output of this gadget can be used to control the DC/AC door-opener motor/solenoid of an electromechanical door opener assembly, with slight intervention in its electrical wiring. (CD4001) is low. The high output at pin 3 of gate N1 forward biases the LED-driver transistor (T4) and the green standby LED (LED2) lights up continuously. The rest of the circuit remains in standby state. When someone interrupts the laser beam, photo-transistor T1 stops conducting and transistor T3 becomes forward-biased. This makes the output of gate N1 go low. Thus LED-driver transistor T4 becomes reverse-biased and LED2 stops glowing. At the same time, the low output of gate N1 makes the output of N2 high. Instantly, this high level at pin 4 of gate N2 triggers the monostable multivibrator built around the remaining two gates of IC1 (N3 and N4). Values of resistor R8 and capacitor C1 determine the time period of the monostable. The second monostable built around IC2 (CD4538) is enabled by the high-going pulse at its input pin 12 through the output of gate N4 of the first monostable when the laser beam is interrupted. As a result, relay RL1 energises and the door-opener motor starts operating. LED3 glows to indicate that the door-opener motor is getting the supply. At the same time, piezobuzzer PZ1 sounds an alert. Transistor T5, whose base is connected to Q output (pin 10) of IC2, is used for driving the relay. Transistor T6, whose base is connected to Q output of IC2, is used for driving the intermittent piezobuzzer. ‘On’ time of relay RL1 can be adjusted by varying trimpot VR2. Resistor R9, variable resistor VR2 and capacitor C3 decide the time period of the second monostable and through it The second monostable built around IC2 (CD4538) is enabled by the high-going pulse at its input pin 12 through the output of gate N4 o the first monostable when the laser beam is interrupted. As a result, relay RL1 energises and the door-opener motor starts operating. LED3 glows to indicate that the door-opener motor is getting the supply. At the same time, piezobuzzer PZ1 sounds an alert. Transistor T5, whose base is connected to Q output (pin 10) of IC2, is used for driving the relay. Transistor T6, whose base is connected to Q output of IC2, is used for driving the intermittent piezobuzzer. ‘On’ time of relay RL1 can be adjusted by varying trimpot VR2. Resistor R9, variable resistor VR2 and capacitor C3 decide the time period of the second monostable and through it on time of RL1. The circuit works off 12V DC power supply. Assemble it on a general- purpose PCB. After construction, mount the laser diode and the phototransistor on opposite sides of the doorframe and align them such that the light beam from the laser diode falls on the phototransistor directly. The motor connected to the pole of relay contacts is the one used in electromechanical door-opener assembly. If you want to use a DC motor, replace mains AC connection with a DC power supply.